Triple cross knit looping along the top edge of a woven tote bag and an example worked flat in the background. Cross knit looping is one of many decorative finishes used on weavings here in South America. 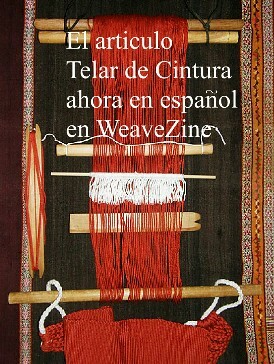 Here in Bolivia, it is used to join and cover the edges of certain woven pieces, such as chuspas. It completely wraps around the edge and so can be used to hide a less than perfect selvedge or, by working it in a completely contrasting yarn color, it can add more life and interest to a piece. 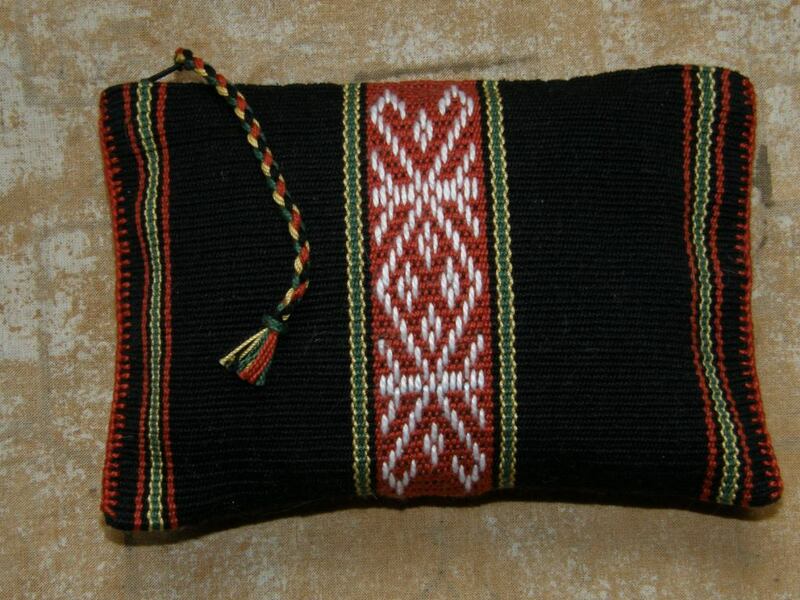 I have used it purely as decoration, to edge a knitted vest where I chose not to use ribbing, to stabilize the flap of a woven shoulder bag where the corners had a tendency to curl and to reinforce the top edge of a woven tote bag. 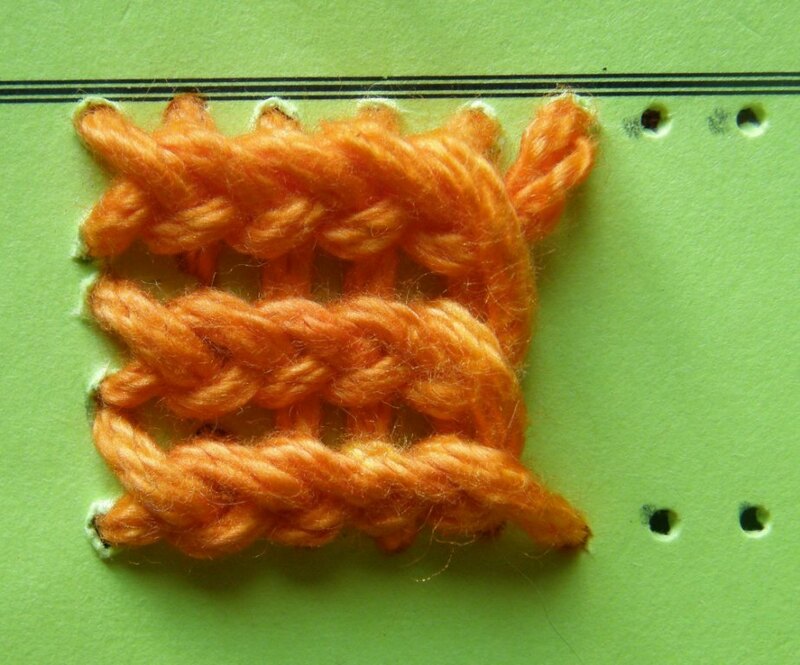 This tutorial is for triple cross knit looping as taught to me by Hilda in Potosi. I suggest learning this technique by working it flat rather than on an edge and I further recommend practicing it on card rather than fabric to start out. I tried doing it with my thickest mercerized cotton but once the “stitches” were photographed up close , all clarity was lost under the fluffiness of the yarn. Yes, I know, you wouldn’t call mercerized cotton fluffy but believe me, in super macro view it is! So I have used a piece of leather instead-the kind that is sold to make necklaces and hope the steps will be clear for you using this medium. All you need to get started is a piece of card, yarn and a sewing needle for your chosen yarn size. Choose a yarn that is smooth rather than hairy- this way it will be a lot easier to see the stitches while you are learning the technique. LEFT: Triple cross knit looping worked flat on a piece of card. CENTER: A drawing showing the individual "stitches". RIGHT: The piece of card I used for this tutorial. I hope that WARP won't mind my having used their Member Directory cover. The green color photographed so well! You can see above that there are three rows of little knit stitches – hence the name triple cross knit looping. When working this on an edge, one stitch will be on the upper surface of the fabric. The middle stitch will sit right on the edge and the third stitch will be on the lower surface of the fabric. I pre poked holes in the card before starting which I recommend doing. Of course, this is not necessary on fabric! The holes are three to four tenths of an inch apart. STEP ONE: Sew three Xs as shown from top to bottom. Using 12wpi cotton and the leather, the length of the three Xs is eight tenths of an inch.When you have completed the bottom X, pass your yarn under the card and have it emerge next to the top X at the point indicated by the needle in the photo. STEP TWO: Now we can start making loops. I have photographed this step and shown it in drawing form. Pass the needle with its yarn under the first X. The card is not pierced in this step. You are simply passing the yarn under the two X threads. STEP THREE: Now we make the second loop. 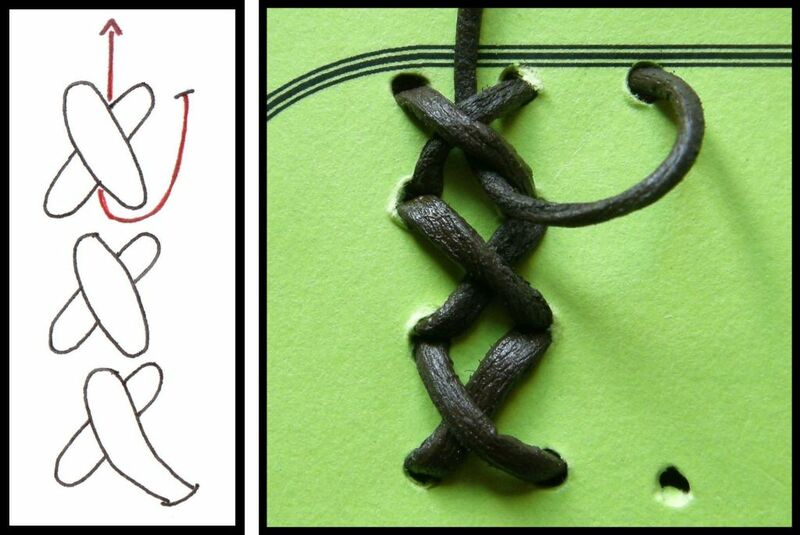 The photograph shows both loops from STEP TWO and THREE. The first loop has been omitted from the drawing for clarity. 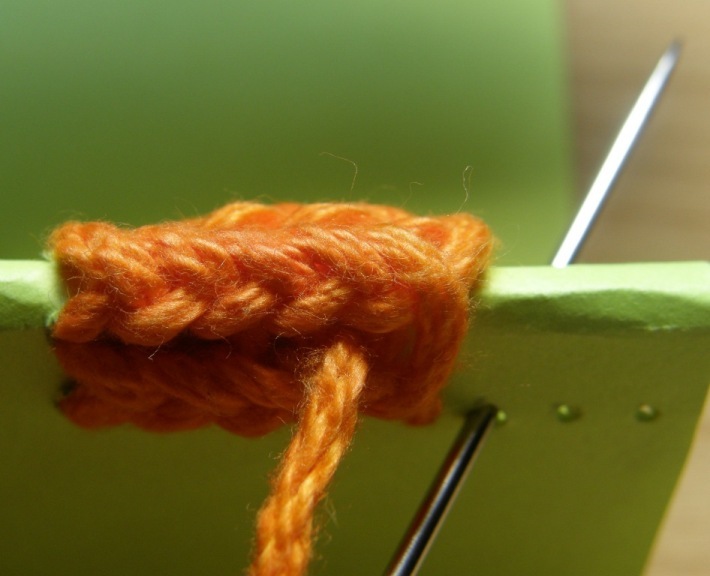 Pass your needle with its yarn up and under both threads of the second X. Once again, the card is not pierced in this step. We have made two loops. STEP FOUR: We can now make the third and final loop. 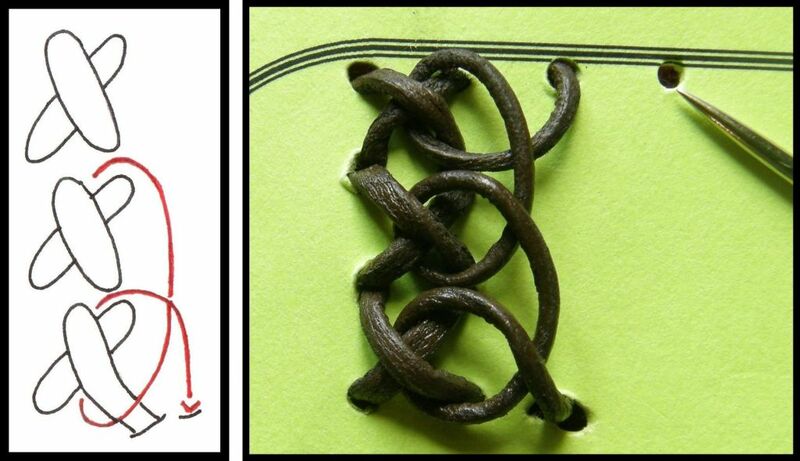 Only the third loop is shown in the drawing. 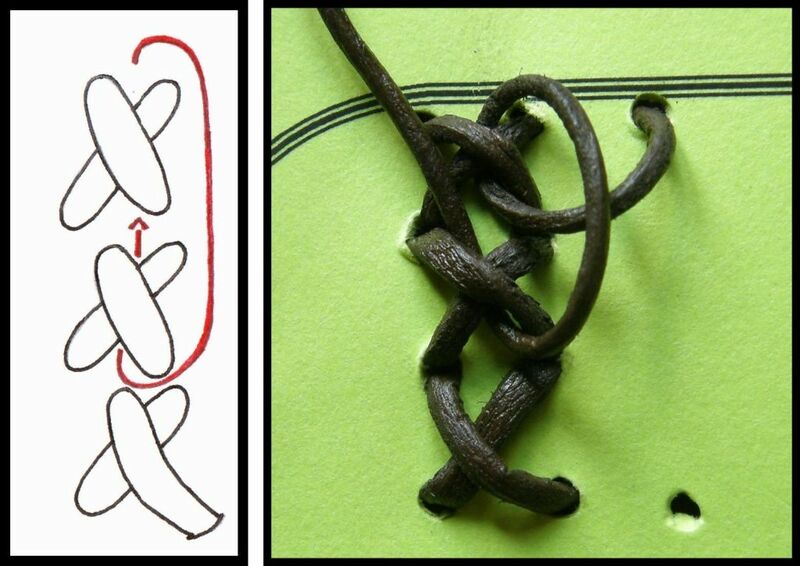 All three loops can be seen in the photo. Pass your needle with its yarn up and under the two threads of the third X. Push the needle through the card as shown. It will emerge next to the first loop as indicated by the needle in the photo. STEP FIVE: We have just finished making three loops but, as you can see in the photo, the crosses in the loops form a new set of Xs. The process now starts again. Pass your needle up and under the two threads of the first X. Continue forming loops on the Xs. The card is only pierced at the bottom and top of the work. Triple cross knit looping in progress in 12 wpi merc cotton. See if you can discern the three Xs in the cotton yarn. Now if you can imagine this piece of card being folded horizontally through the center X, you will have an idea of how it will look on the edge of a piece of fabric. Here it is on the folded cardboard. You can see that the middle row of stitches is sitting right on the edge. Now it is clear that when you are working this on the edge of a piece of fabric, the needle is simply passing through the fabric when it travels from the bottom of the last X to the top of the first X. The first time you try to work this on an edge, make sure you use a yarn color that contrasts with the fabric color or it will be almost impossible to see the X s and loops. Once you have more experience with the technique, you can try it with other yarn colors. When your needle is under an X in the position shown in STEP FIVE, try to remember to drag it and the stitch sideways before pulling the yarn through. This helps to stretch the stitches across the fabric and stop them from bunching up together. 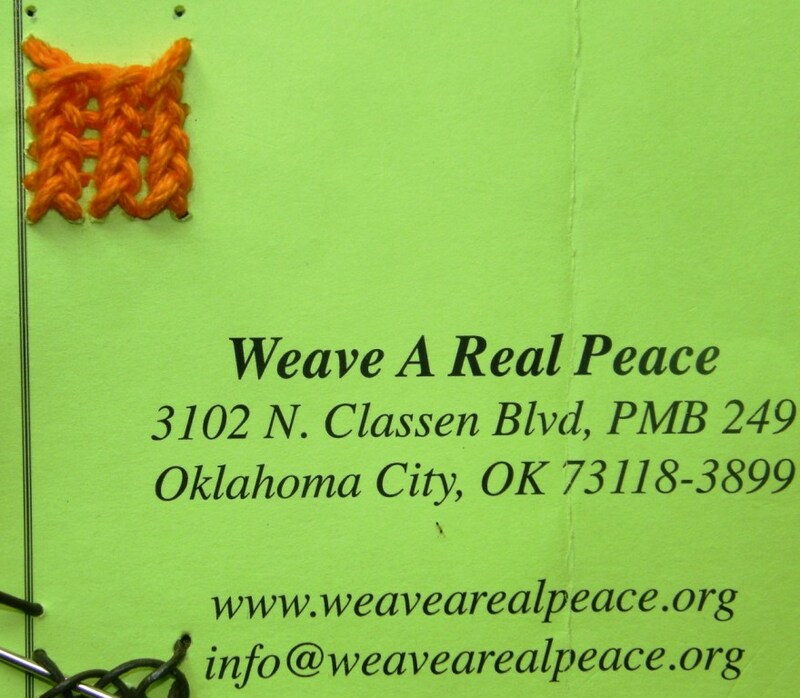 I will leave you here with the web address for WARP – Weave A Real Peace- which you may like to check out. And, here is a photo showing triple cross knit looping that I used to edge a knitted vest and a woven bag. 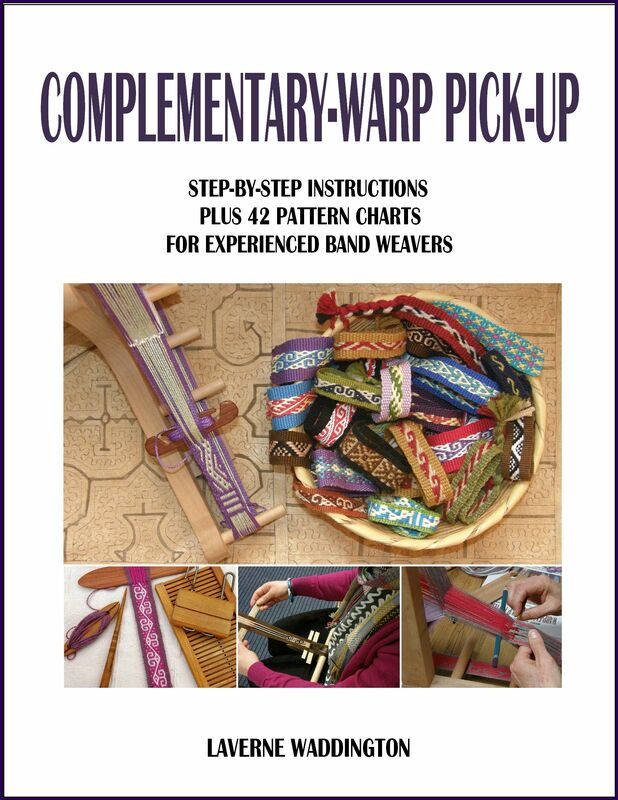 I hope you find this technique useful for your own projects.I have also seen it worked around the tops and bottoms of braids. Triple cross knit looping worked on the edge of a knitted vest and woven bag. 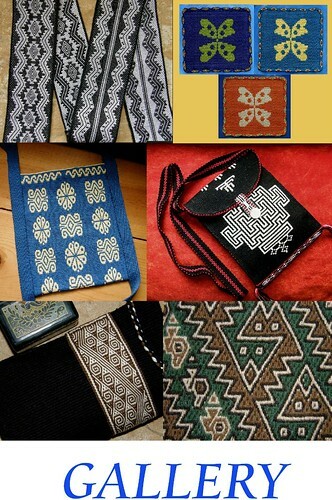 I used a single column of cross knit looping to edge these pieces that I made with traditional motifs of Vietnam. In this case you would only sew one “X” to start and go looping through that. that´s similar to a knitted applied I-Cord, isn´t it? Have to try this, it looks very nice. You know, I didn’t know what an I-cord was so I watched a Youtube video. 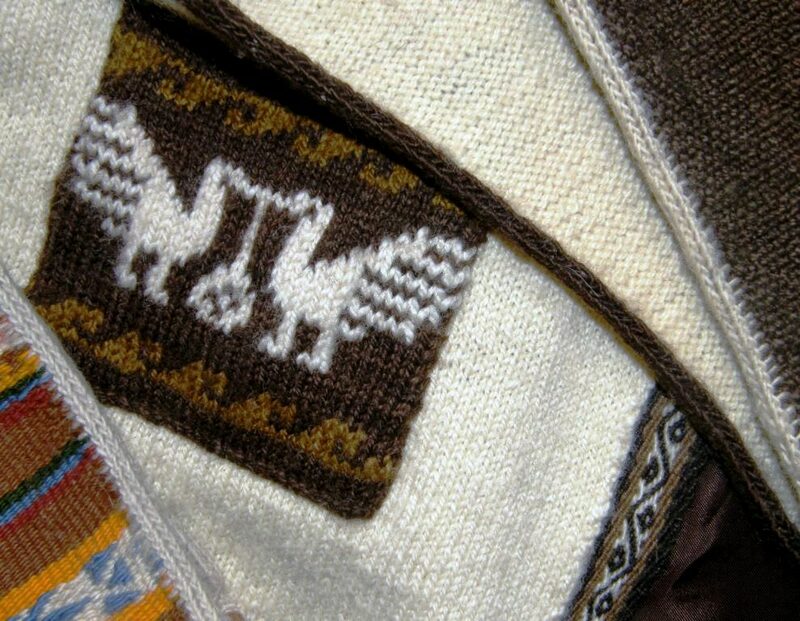 The main difference is that wiith the cross knit looping, the edge of your woven piece gets embedded within the three rows of knit stitches and so gets completely covered from both sides. I’m guessing that if you sewed an I-cord onto an edge it would just kind of sit on the edge. I read some suggestions for using the I-cord for applique work-that sounds like a nice idea. Yes you are rigth! Shouldn´t read posts like that while half asleep, I didn´t look at the last pics where you folded the cardboard. The applied I-Cord is just connected where you pick up the stitches and looks different as well. The I-cord looks very nice as applique work. I saw a book on amazon just a few days ago and on the cover was a bag with celtic pattern appliqued with I-cord. Very nice! Unfortunately I can´t find the link again. There are so many things to try out. Can´t wait to finish my thesis and have some spare time. 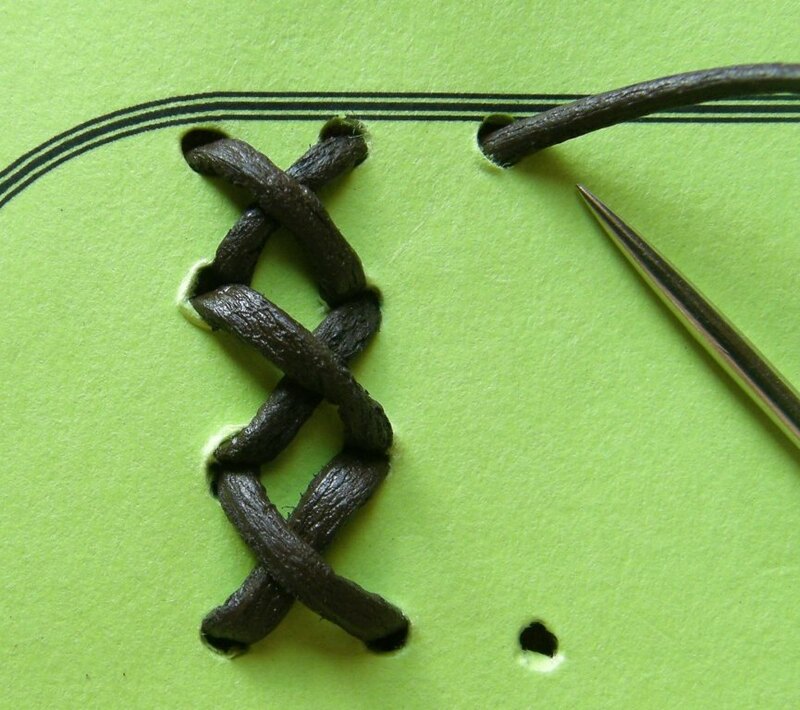 Nice finishing stitch. Just so I’m clear, this is done with a big needle with eye, like a cross stitch needle, or with a knitting needle? It’s done with a sewing needle, Franco- a needle with an eye-or anything that will serve to pull the thread through the Xs. In fact, I didn’t use a needle at all with the leather as I didn’t have one with a large enough eye. I gave up trying to thread it! That leather is rather thick. Fortunately the leather was quite stiff and so I could just poke it under the Xs and through the holes in the card on it’s own. I’m so excited about this! Thank you SO MUCH for the tutorial! I tried it a bit today on some cardstock, and I’m going to practice some more before I attempt to use it on any of my weaving. I had a question. Is the middle stitch “in” anything? Is it on the very very edge of the fabric/weaving? Or only the first and last stitch actually in/through the fabric? Thank you again! I love the look of this, and you explained it so well! That was quick!-you have already tested it out. You said that you have already tried it out flat on a piece of card. Now you can try again sewing your first 3 Xs on a flat piece of card and then fold the card so you can pretend that it is two pieces of fabric that you want to join and edge. Don’t fold it sharply-just bend it in half so the the middle X is sitting on the edge. Then you will understand exactly how it works. You will see that when you pass the needle through the card, you are joining the two layers together. The middle X just sits there on the edge joined to the other two stitches. I’m confused about starting if I want to edge a piece of handwoven fabric … would it be a good idea to make three cross-stitches in the corner to start the edging (just want to cover one cut edge, not join any pieces). If I used the same handspun wool it could be very bulky … but the knit pieces shown look like it squashes out after pressing. It is bulky, Betty and doesn’t flatten out after pressing. Imagine a tubular cord that has been slit and your edge has been inserted within. That is what it is like. 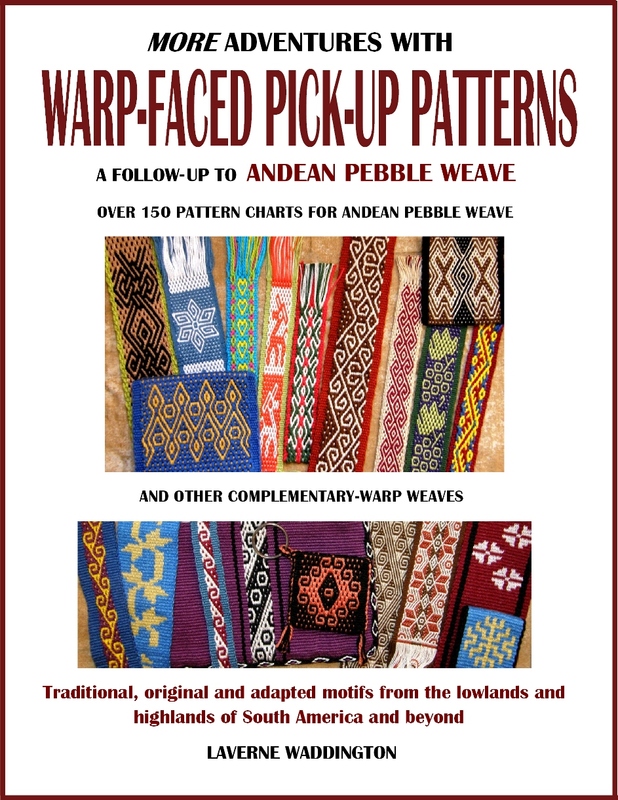 I learned single cross knit looping in Peru to edge the cradle of Andean slings and I could do a tutorial on this next week if you like. It is a lot less bulky. I was taught to work it in two colors and it is also very pretty. If you want to edge a piece of fabric you start by sewing the three Xs at the left end of your edge. Imagine the piece is on your lap right side up. The first X will be sewn on the wrong side, the second will span the edge (the center of the X will be right on the edge)and the third will be on the right side. I have only used this on selvedges of woven fabrics- not on cut raw edges- and the edge of knitted pieces. Laverne, this is an easy and clever way to “fix” edges and make them pleasing. I’ve been weaving shawls on the RH loom and need an edge. You are welcome. I have never used it on something like a shawl that has a lot of drape. I suspect you would need to do it with a fine yarn and keep it quite loose. My experience with it has been on warp faced textiles. That’s what I was thinking – thin and loose. RH tends to have messy selvages. 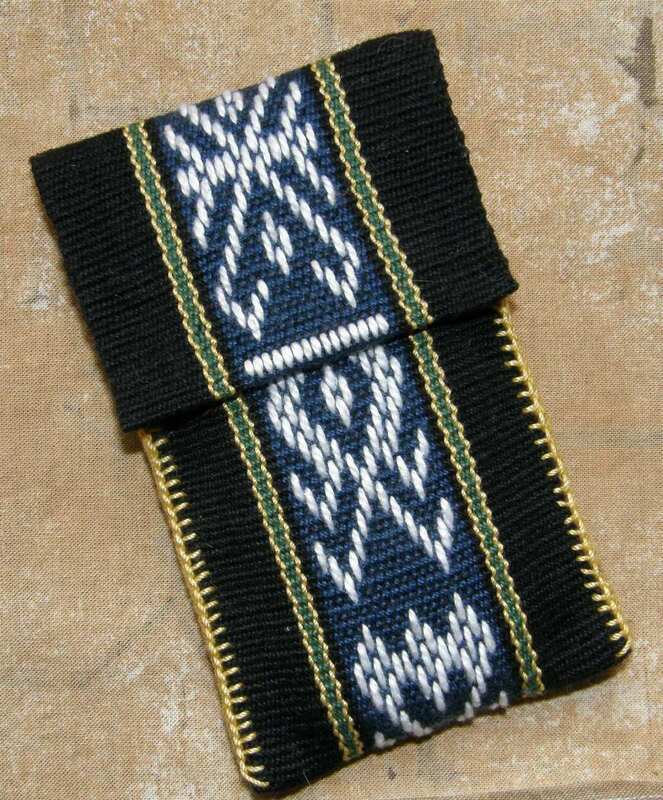 Something that would encase the edges with a slightly decorative edge without taking away from the weaving. Love this edging. I generally work cross-knit looping in the round for things like bags. Lots of wheels turning in my head — thanks! Cross knit looping in the round….I would love to see that. April 27-emailed a pdf to you today. Are you not able to download the page? I am just catching up with this entry…fabulous! 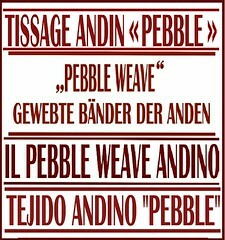 I’m a complete newby to weaving and how to attractively join two pieces of weaving (when I start needing that) has been puzzling me. I used a single version of this on the Vietnamese pieces I just wove so you just sew one “X” and go looping through that. I really like it. I’ve always wanted to know how this was done. I have seen something similar here in India – just didn’t know what it was called. Thanks for the wonderful and easy-to-understand tutorial. 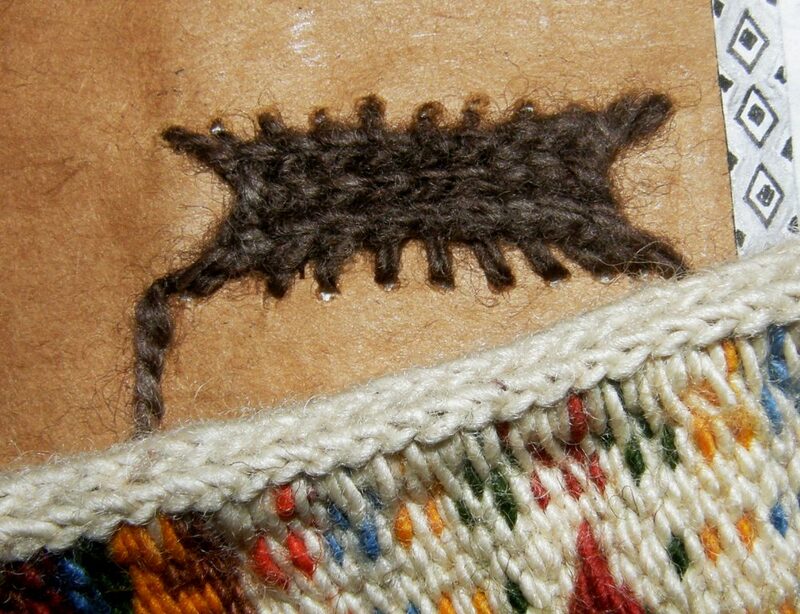 Oh, wow, that’s nalbinding, of the sort used in the Egyptian Coptic socks that people used to think were some of the earliest known knitting in the world. That is a great page of instructions. Thanks for the link, Naomi (and Karen Sullivan). I have heard of and always wondered about nalbinding. When I first posted the instructions for cross knit looping someone told me that they would be of interest to nalbinders. I recently joined Ravelry and know you as Warmi. I’ve been working my way through your blog posts and when I came across the cross-knit looping I was surprised to see how much it resembles french hitching, an old sailor technique used as a covering for tool handles and water jugs. I know it from Hervey Garrett Smith’s book “The Marlinespike Sailor” originally published in the mid 1950s. It’s worked from a base string around the object to be covered and provides a non-slip grip and padding for glass bottles. Amazing how so much of what we do is related! Hi Clayton. Nice to meet you and thanks for the interesting comment. I must google french hitching and see if any images come up. I imagine something like this would look really attractive on a bottle apart from being very practical. Thank you for this tutorial! 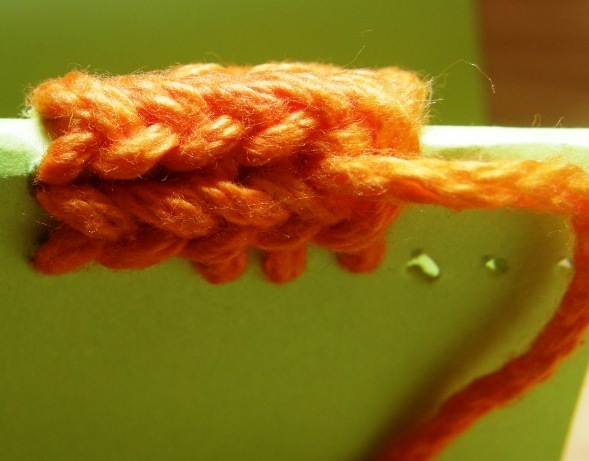 This is exactly the kind of edging that was used on my grandmother’s shepherd bag from Dalmatia and I really wondered how it was done because to me it seemed like a very complicated braiding. I am very much into sling making and I thought about using this technique as a sling reinforcement even before you mentioned that it actually is used for that purpose. It would be really great if you would do a tutorial on those edgings! 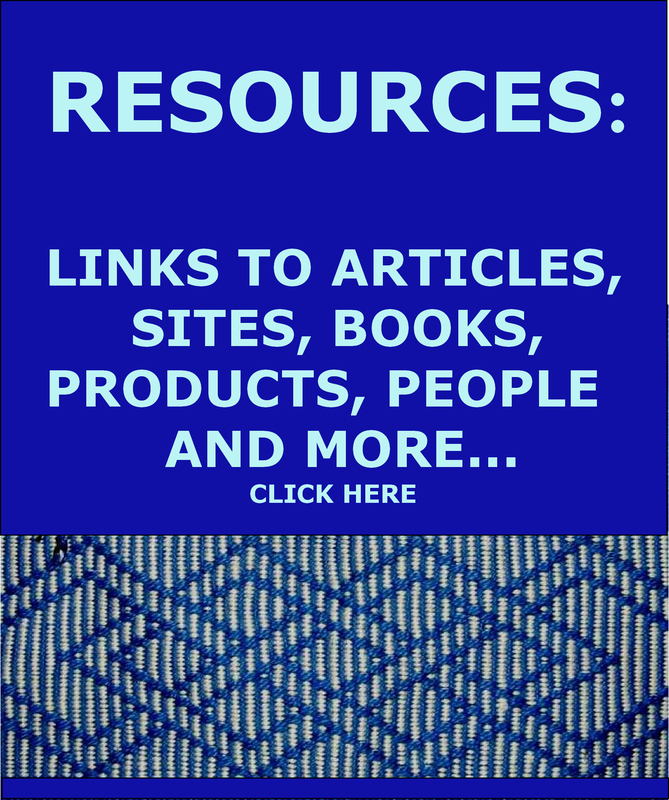 Thanks again, this site is a great resource! Hello again! For doing the single cross-knit loop to join two pieces, does it matter how long the “legs” are? Also, just so I’m clear is it: make the first “x”, come up in the top of the next row, go thru the first “x”, then down at the bottom? I’d love some pics for that, as I’m trying to make a bag for my Mom. You decide the length of the ‘legs’. I connect the two pieces here and there with small stitches just to get everything stabilised and then o the loop stitch on top.